Bootie LA – Shabbat Shalom Motherf*ckers! 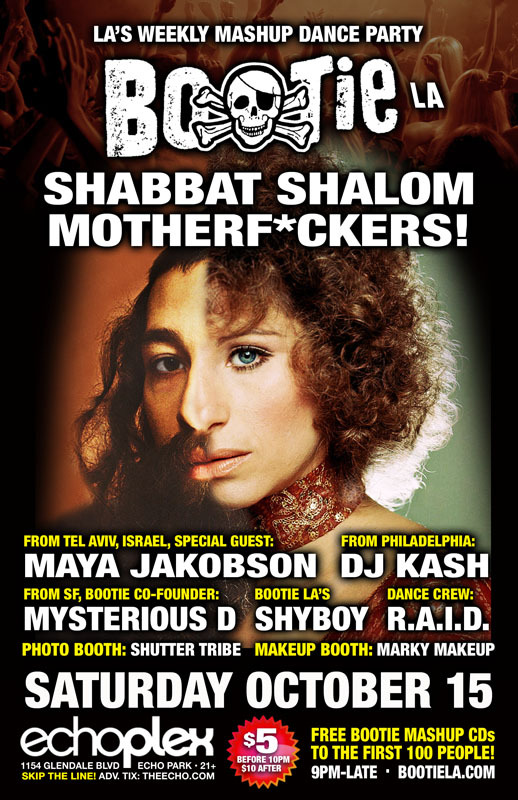 Los Angeles Bootie LA – Shabbat Shalom Motherf*ckers! Bootie LA breaks bread with Israeli mashup DJ and producer Maya Jackobson, flying all the way from Tel Aviv to say Shabbat Shalom Motherf*ckers! DJ Kash from Philadelphia joins in. No genre or era is safe! Only $5 before 10 PM! Technically, the Jewish Sabbath ends by breaking bread at sundown on Saturday — but Bootie has never been one to pay attention to the rules, so we’re ending it with a party that rages late into the night — Shabbat Shalom Motherf*ckers! Special Israeli guest DJ Maya Jakobson — from Tel Aviv’s best mashup party, A.D.D. — will be joined by DJ Kash from Philadelphia. Together with Bootie LA resident DJs Mysterious D and ShyBoy, they’ll all be throwing down the best mashups in the world! Plus resident dance crew R.A.I.D. (Random Acts of Irreverent Dance) has the chutzpah to take over the stage with their usual go-go madness, while Marky Makeup gives your faces and bodies a makeover, and Shutter Tribe captures all the fun! All this, plus FREE Bootie mashup CDs for the first 100 people through the door!